It’s time to learn a little bit more about one of our all important Skaters! 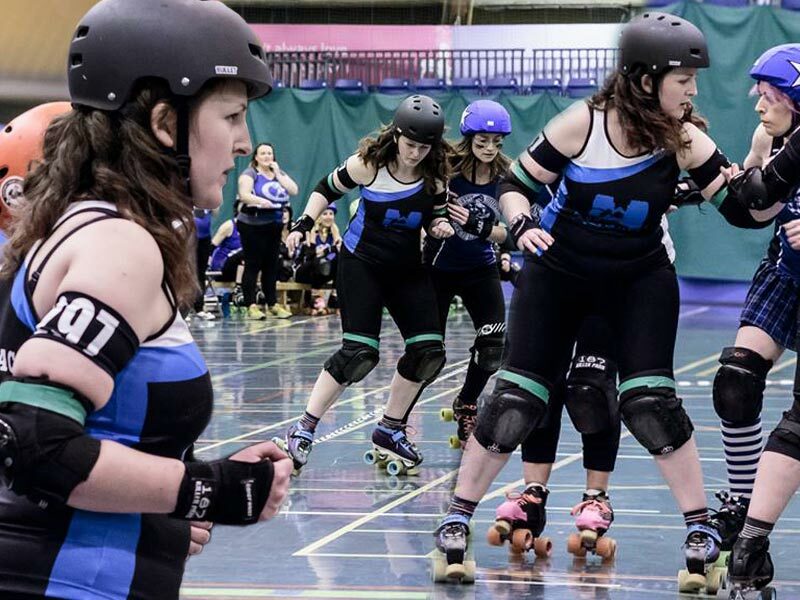 August’s Skater Spotlight is going to introduce you to the wonderful #297 Mane-iac – Helgin’s Treasurer; last remaining founding member; and one of our BRSF qualified Beginners’ Coaches! Mane-iac in action, photos courtesy of Laura MacDonald. I used to be an accountant, but with three kids, I’m currently a stay at home mum. I like to read, spend time outdoors and enjoy the occasional crafty project. I’d love to go to the Maldives, but I’d settle for any sunny, peaceful beach with plenty of cocktails on hand. I can knit – I design and knit novelty Christmas jumpers for my children every year. I’ve always enjoyed roller skating. A couple of years before starting with Helgin, I bought a pair of skates and went out in those a few times. I’d seen Whip It and thought derby looked amazing fun, so when I saw a post on Facebook about a group trying to start a roller derby team, I just had to be part of it! There are so many amazing people involved in derby but if I had to choose one that stands out to me, it would be Krusty from Granite City Roller Derby. She has helped Helgin from the very beginning, supported us in our development and is always there for advice when needed. She’s also a fantastic skater and all round lovely lady! Don’t compare yourself to other people, try to look at how far you’ve come personally and be kind to yourself! I’ve met the most amazing bunch of people and it’s always great fun spending time with them, whether it’s on the track or off. Playing in Helgin’s first game. It felt as though Helgin had finally achieved what it set out to do, we were a bouting team. It was an amazing day and I was very proud to be part of it.